If you have family or friends coming round, Annabel has got it covered with superb ideas for easy weekend entertaining and show-stopping desserts. Impress your dinner guests with Annabel’s succulent Venison Casserole or aromatic Oriental Roast Duck, followed by Berry and White Chocolate Tart. With beautiful photographs and fresh design, this is an essential book for every modern parent. The chapters are designed to make choosing a fuss-free dish simple. Many recipes include swap-outs to cater for those with food allergies, intolerances or particularly fussy eaters! Annabel makes it easy for you to give your child the very best start in life. 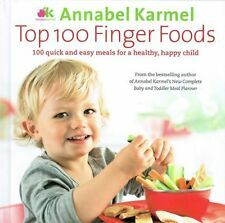 Annabel's Quick and Easy Weaning makes for happy, healthy babies. 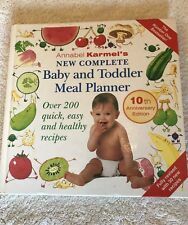 Quick & Easy Weaning. At MBS-Books you will find what you are looking for that will help you make those POSITIVE changes! Angellica Bell has not only spent years as a presenter on CBBC and BBC, she's a fantastic cook who won BBC TV's Celebrity Masterchef. Through 30 fun, step-by-step recipes that she makes with her own children, in Fantastic Eats! Good nutrition is important and can help youngsters get a better night's sleep. At MBS-Books you will find what you are looking for that will help you make those POSITIVE changes! Each and every order we receive is treated with one simple rule; we promise to provide you with an honest, professional and efficient service. Christmas Cakes,Cookies & Sweets. 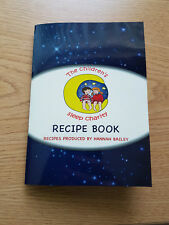 Young Chef Children's Cook Book. Snowball Cakes. Christmas Party Cakes. Christmas Tree Cookies. Santa Sweets. Angel Cakes. Sweetie Cookies. Nancy Drew Cookbook by Carolyn Keene (Hardback, 1973). Cooking for the Family with Stork Vintage Cookery Book c1960 Small 5x5 inches Published London Stork Cookery Service. 24pages Lovely Vintage Booklet In good condition Any questions please ask. Author:British Diabetic Association. Fun Cooking for Children. General Interest. Each month we recycle over 2.3 million books, saving over 12,500 tonnes of books a year from going straight into landfill sites. (4)Party Food. Titles in This Set. 5)Lunchboxes. Cooking the. Each book in the Cooking Around the World series includes Polish Way. Polish Way serves up tantalizing recipes for pierozki, cabbage rolls, honey cake and much more. Series designed for a young, inexperienced cook. JANE ASHER'S - CHILDREN'S PARTIES. THIS BOOK IS FULL OF IMAGINATIVE IDEAS FOR PARTIES FOR CHILDREN AGED 1 TO 12. INSTRUCTIONS ARE INCLUDED FOR EASY-TO-MAKE- FANCY DRESS OUTFITS AND THERE IS AN EXTENSIVE COLLECTION OF PARTY RECIPES FOR BOTH FOOD AND DRINKS. Enchanted Cakes for Children by Debbie Brown Hardback Book. The book is in very good condition, Sleeve is a little tatty. Bundle of 4 books suitable for both adults and children. • Sugar Animals by Frances McNaughton • Sugar Fairies by Frances McNaughton • Decorated Cupcakes by Frances McNaughton • Decorated Cookies by Lisa Slatter Easy to follow instructions which show how you can decorate your baking. In very good condition. From a smoke and pet free home. Lovely book in excellent condition. Featuring more than 25 foolproof recipes, the festive fun starts right here. More than 25 delicious and fun recipes. 20 x 20 x 1 cm. The books will be clean with no stains. All used books are checked. All pages with be present no tears or missing pages. It is important to begin your baby's life with a healthy nutritious diet so that they start as you hope they will go on. It starts at around 4 to 6 months and lasts until about 12 months. This original, fun and easy-to-follow book is written by a mother with experience of bringing up two children. A fantastic book if you love designing cakes for children. Easy to use spiral binding. Step by step recipes with photographs. Very good used condition. SORRY FOR ANY INCONVENIENCE. Title: Finger Food for Babies and Toddlers. Item Condition: used item in a good condition. What foods are best. I.e- being fussy! Format:-Paperback / softback. Publisher Date:-18/12/2018. 100 fuss free family recipes. 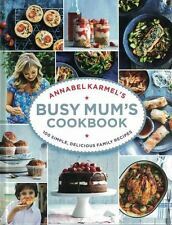 Annabel Karmel. Never Used - Just flipped through. I also have many other items for sale. Thank you. A very good clean copy. Was first published 1972 this is third impression 1975. Ink stain to top of pages from page 20. Both in a used but good condition. First edition 1974. Laminated, unclipped pictorial dustjacket. Approx Book size: 9.5" x 7". NICE USED 168 PAGED HARDBACK BOOK. TITLED COOKING TO MAKE KIDS SLIM. BY AUDREY ELLIS. PUBLISHED BY STANLEY PAUL IN 1976. THE BOOK HAS RED COVERS WITH GILT TITLES ON SPINE. Kid Chef Every Day The Easy Cookbook for Foodie Kids by Colleen Kennedy 9781641522229 (Paperback, 2018) Delivery UK delivery is usually within 7 to 9 working days. International delivery varies by country, please see the Wordery store help page for details. Quick And Clever Party Cakes. Lindy Smith (Murdoch Books) Paperback 2014. Separate Nutrition for Children - 207 Pages.